real motorbike handling and is a spectacular experience! Our new motorbike is available now in a set of two! for an immersive motorbike riding experience. The motorbike mounted to the motion platform is a real Yamaha (or similar) race motorbike. Acceleration, shifting and braking of the motorbike is similar to driving a real motorcycle. Multiple feedback mechanisms control the simulator. 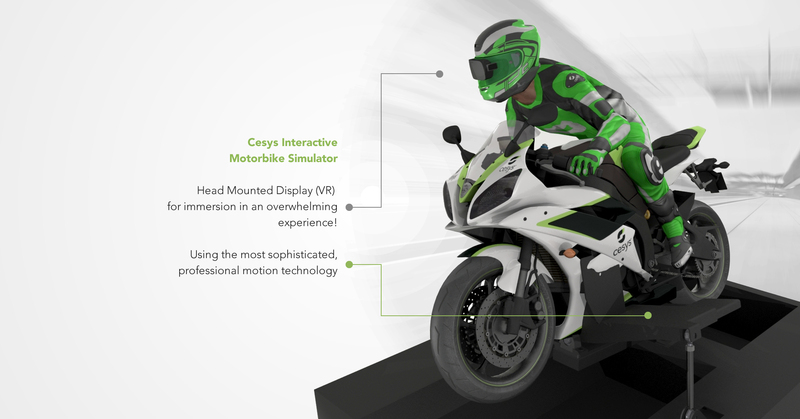 Unlike other “gaming”-motorbike simulators on the market, which feature steering feedback only, Cesys uses a high-end combination of steering-force input and a body-tracking system. Together, these systems determine the input to the motorbike. These features are unique to Cesys. The motorbike handlebar is attached to the force feedback control loading motor. The force feedback system registers the forces the rider exerts on the handlebar. These forces, combined with rider-lean are used to determine the motorbike’s steering behavior, just like on the real bike. In addition to the handlebar input, a system consisting of multiple cameras monitors the rider’s body position relative to the motorbike. The simulation engine uses this data as input on the motorbike simulation model, which increases the level of realism and immersion when riding the simulator. Unlike arcade-style motorbike simulators, the Cesys Motorbike Simulator has a functioning throttle, hand brake, foot brake, clutch and shift lever, all of which contribute to the ultimate riding experience. Our new motorbike is available now! Cesys is world leader in designing interactive driving simulators for the entertainment/ attraction market. The knowledge and experience of over more than 15 years’ experience comes together in the motorbike simulator. Using the latest technology in VR combining with interactive motion is unique in motorbike driving simulation. Driving the motorbike feels intense, real and immersion is an overwhelming experience. The motion is designed and produced by Cesys. The motorbikes are straight form the factory real race motorbikes. The motorbikes have to be reinforced for use on a simulator though as it’s a much harsher environment and we need to make them last. New! 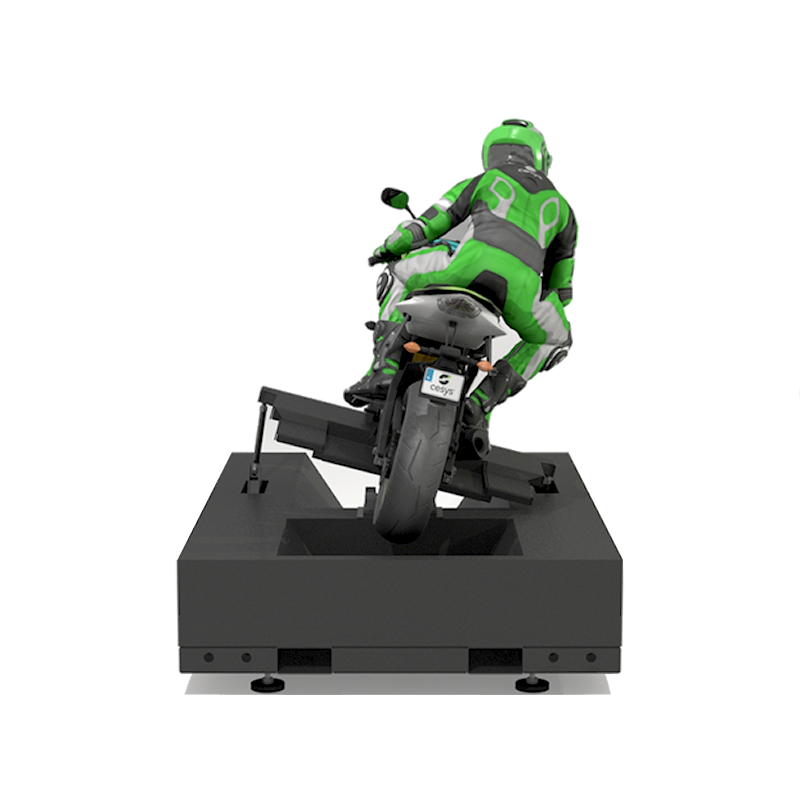 The ultimate, interactive, motion motorbike simulator with HMD. Cesys has a various number of different race car simulators. Flight through the skies. The Cesys Flight-Ride is a new attraction that puts guests in a hang-glider, high above spectacular breath-taking views.